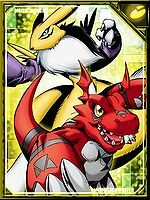 A Beast Man Digimon with the appearance of a golden fox. 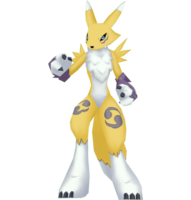 The relationship Renamon has with humans is directly apparent; it is said that depending on how it was raised during its time as a Baby, it can evolve into a Renamon of particularly high intelligence. It is always calm, cool, and collected, as well as disciplined enough not to lose that composure in any situation. 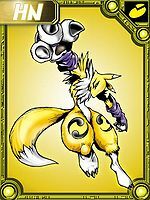 Its slender, tall appearance stands out when compared with other Child levels, and rather than emphasising on power in battle, it instead makes sport of the enemy with various techniques that utilise its speed. 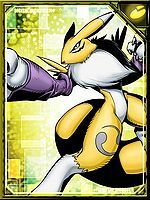 Its Signature Move is a transformation art in which it copies the opponent's appearance and re-covers itself in that texture (Kohenkyo). 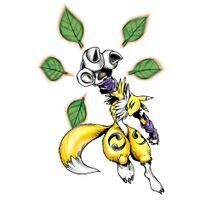 Its Special Move is throwing sharpened leaves at the opponent (Koyousetsu). 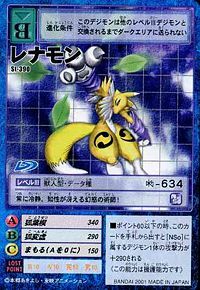 n., From Renard (「レナール」 Renāru), meaning fox. Koyousetsu Fires a barrage of sharpened leaves at the opponent. 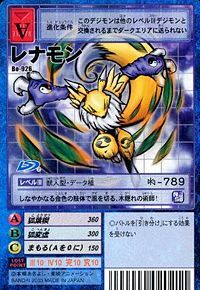 Copies the opponent's appearance, or, (in Battle Evolution) switches places with them in a whirl of leaves. 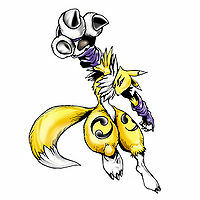 In Digimon RPG, teleports to the enemy and kicks them before disappearing. 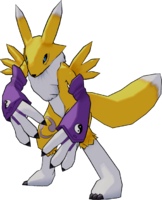 In Masters, uses a glowing hand to summon two phantom clones of itself to attack the enemy. 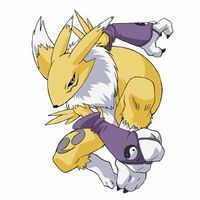 Power Chop In Digimon Tamers, ignites its hands and feet in blue fire and attacks the enemy with them. In Another Mission, hits the enemy with a powerful hand strike. Shōda  Palm Strike 掌打 N/A Palm Strike Attacks with a strong hand strike. 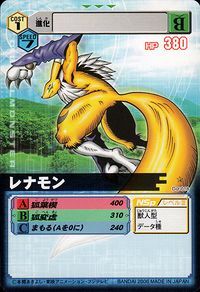 Sōzan  Claw Slash 爪斬 N/A Swift Strike A swift claw attack. 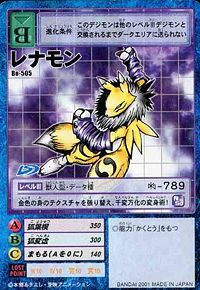 Kokaishū  Fox Spin Kick 狐回蹴 N/A Spin Kick Attacks with multiple roundhouse kicks. 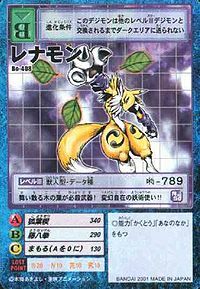 Kūchū Koyōsetsu  Aerial Fox Leaf Arrowheads 空中狐葉楔 N/A Diamond Storm Uses Koyousetsu while in midair. 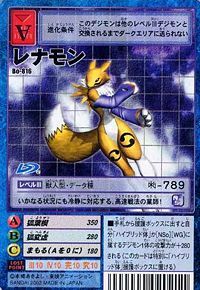 Korenkyaku  Fox Combo Kick 狐連脚 N/A Rapid Kick Spins about before unleashing several high kicks in rapid succession. 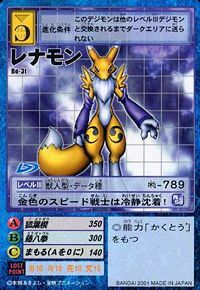 Kosengeki  Fox Flash Attack 狐閃撃 N/A Super Chop A swift claw attack. 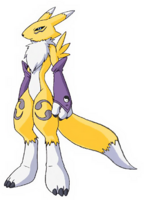 Renamon is the partner of Makino Ruki. 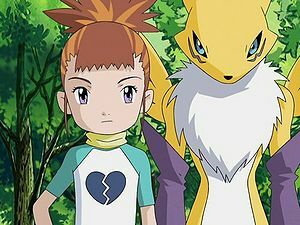 Despite her clear sense of justice, she was loyal to Ruki, and felt inclined to follow her human partner no matter her decisions. 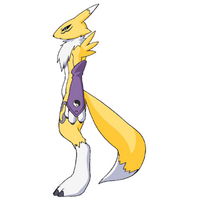 Ruki and her partner, Renamon. 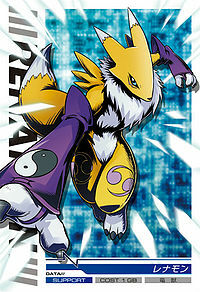 Renamon is a playable character that evolves to Sakuyamon. Renamon is an obtainable partner digimon. You can get it in the Balanced Pack and Offensive Pack. 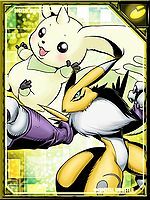 Renamon appears as the partner Digimon to Kagura Yuma. It retaliates quickly with its many techniques! 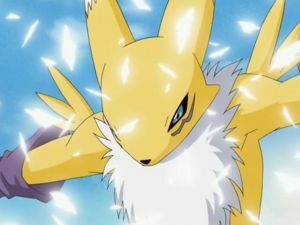 It uses its transformation arts to toy with the enemy! This bewitcher always stays cool-headed and sharp with knowledge! 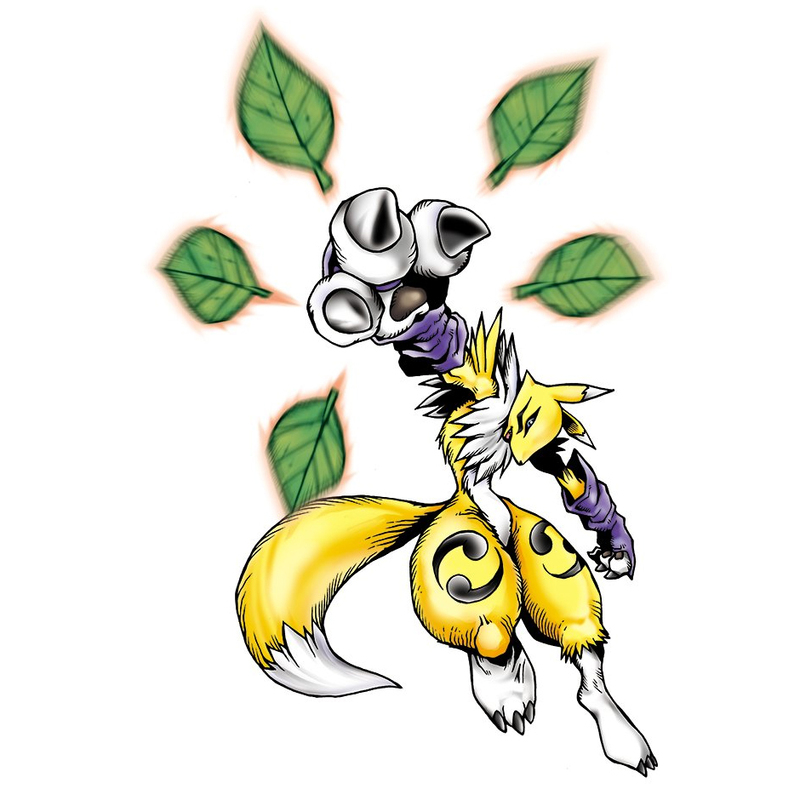 The dancing leaves are its killer weapons! A phantasmagoric bewitcher!! 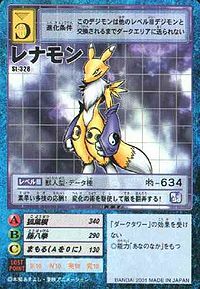 It covers up the texture of its golden-coloured body with its shapeshifting technique of infinite possibilities! This master of high-speed battle techniques keeps a cool head regardless of the situation! 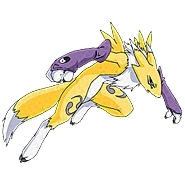 An expert in hiding among trees, its nimble golden figure cuts through the wind! 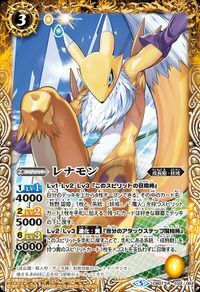 This high speed golden warrior is calm and composed! A cool warrior! It eats fast and fights fast! 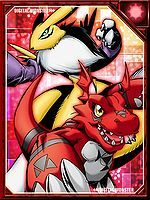 A highly intelligent Digimon, its intelligence is also based on its relationship with its partner and how it was raised as a Baby. 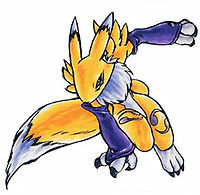 It excels at speed rather than strength, using it to confuse enemies in battle. 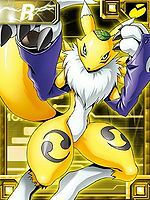 Makino Ruki's Partner Digimon. 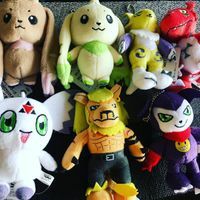 In its quest to attain further strength, it joined up with Ruki, who held the same ambition. 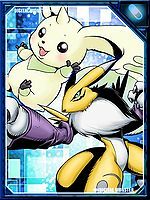 (Promo Card) Illustration for the Digimon Web Official Twitter Illustration for the Digimon Web Official Twitter Illustration for the Battle Spirits Collaboration Booster: Digimon - Settle it! 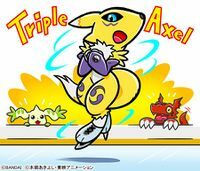 Card Slash! 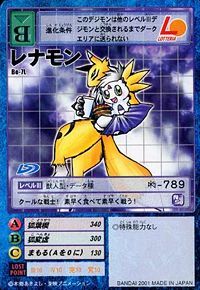 ↑ "Tohachi-Ken", also known as "Kitsune-Ken" (狐拳), is a hand game invented by Tohachi Okumura during the Tokugawa Shogunate. 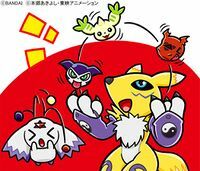 Similar to rock-paper-scissors, it uses gestures for a daimyo, rifle, and fox. This page was last modified on 19 April 2019, at 22:40.